Minimalism is a concept which marries functional design with a simplified way of living. A celebration of simplicity; it's design that’s stripped down to its essential purpose by eliminating anything unnecessary. 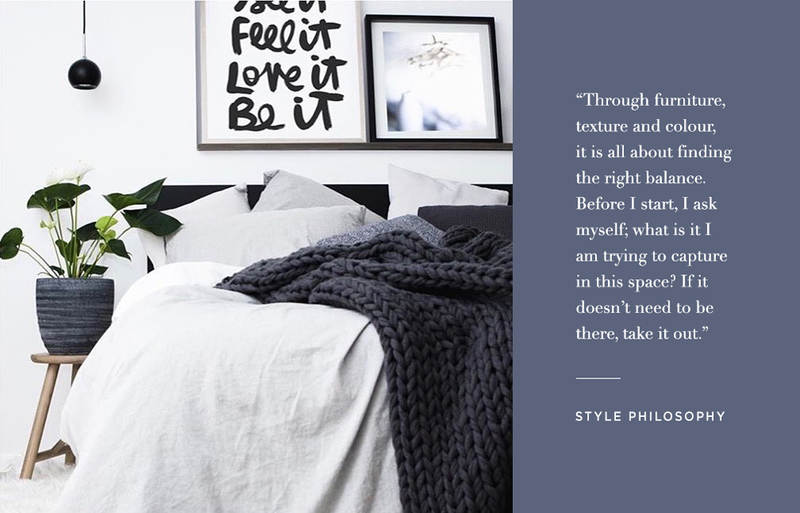 This week we interviewed Liz Amaya, an interior stylist based in Brisbane who embraces the philosophy "less is more". Adopting a minimalist approach, she believes in only using the bare essentials when it comes to design. In this interview, Liz talks about her creative process, shares styling tips and reveals the most valuable lesson she's learnt in her career. 1. Tell us a little about your background – what steps did you take to prepare yourself for a career in interior styling? It was a natural progression as it is something I have always had an interest in and love for. We built our last house and are currently renovating the one we are in. I have always loved anything to do with Interior and Home Deco and so I started taking pictures of our home and the new renovations. From there I have grown my Instagram account @_la.style filled with Interior Inspiration. I now work with some amazing small and large businesses styling their beautiful products. 2. What is your interior style and approach? Style is such a personal thing. For me I am all about simplistic styling and minimalism. Like the old KISS principle; keep it simple stupid. So much can be said in a space with the fewest of items. Through furniture, texture and colour, it is all about finding the right balance. Before I start, I ask myself; what is it I am trying to capture/showcase in this space? If it doesn’t need to be there, take it out. 3. Where do you seek style inspiration? What websites and magazines do you read to stay on top of design trends? I seek a lot of my style inspiration lately through Instagram and also magazines. It sometimes starts with a picture that catches my eye and then it takes me to another picture or another account and so on and so on, and then an hour has passed! It is so easy to get lost through beautiful imagery of Interior Inspiration. I also love to have a peaceful browse through Home Beautiful and Real Living magazines. 4. From your point of view, is interior design an art or a science? Interior Design for me is definitely a form of Art. It is all about expressing yourself through creating functionality in a space. Through decorative art, textile furniture and lighting design whether it is where we live, work or play. It should be fun and showcases your personality and passions. 5. In your imagery, your bedroom exudes a comfortable and breezy style. What are your top styling tips for creating a relaxed, cozy bedroom? A bedroom is such a personal space. It’s where we go to unwind and relax. Creating a cozy bedroom is all about picking elements that you love and that you feel calm within. Start with a style – whether it be a Nordic theme, coastal or Industrial. Then pick your big ticket items like the bed, furniture, then artwork. From there you can pick your textiles and ascents to compliment the larger pieces in the room to bring it all together. 6. You recently styled our Vintage Softwash Quilt Cover Set. Can you guide us through how you put this look together? I really enjoyed styling the Vintage Softwash Quilt Cover Set. I am a huge lover of grey and the blues so this colour was so easy to work with. I tried to select pieces that really complimented the softness and simplicity of the cotton. The throws and cushions I used to style with were ink navy and charcoal tones which compliments the grey in the quilt so beautifully. Our bedhead is matt black as are the dual pendant lights which add a bit of drama to the space, alongside the blonde timber floors exuding the Nordic theme I love and aspire to create. As with all my styled spaces, I try to add elements of greenery for some life and to tie back to nature. 7. As a lover of fashion as well as home interiors, how do you see the two relate to each other? Home Interior and Fashion I believe are very similar and close to my heart. Style is very personal and like what we wear day to day our home and Interior is a form of our style. Just like fashion trends that come and go so does Interior trends. 8. You recently tried our Beautysilks Silk Pillowcase. How did you sleep? They are wonderfully soft and smooth. The pure Mulberry silk against your face and hair is naturally hypoallergenic, containing anti-ageing amino acids that can replenish treated or damaged hair and skin - all whilst you sleep. I really noticed the difference and have been sleeping like a baby. We really love them and now the kids are asking for them on their beds! 9. What is the most valuable lesson that you have learnt in your career so far? For any small business to succeed, whatever the amount of time it takes to get a small business up and running, it takes double to keep it afloat. It is all about supportive networking and creating good relationships with brands and clients.